Patients come to us and always want to know if it really matters whether or not they add exercise to their new way of life. When it comes to exercise and weight loss, sometimes we need a reality check. It is much easier to cut 1,000 calories from a bloated diet than it is to burn off 1,000 calories through exercise. Exercise is good for reasons that go way beyond calorie burning. There are the benefits of improved cardiovascular status, bone-joint health, mental and emotional improvements, and the total mind-body benefits of exercise. Typically when a patient focuses solely on diet, they are not very successful in the long run without also focusing on physical activity. Initially, you can be very successful at weight loss through diet alone, but the benefits are typically short-lived. There is plenty of data to show people regain the weight if they are not physically active in addition to their improved diet. The key to weight loss and maintenance is not diet alone or exercise alone; it is very important to have both components. Is It Ok to Splurge as Long as You Exercise? Exercise does not buy you as much calorie wiggle room as you might think. If you exercise in order to increase the number of calories you can eat, you are not reaping all the benefits. If you want to eat more because you exercised, you should only eat back half of the calories you burn. Keep in mind, the average person overestimates the amount of activity they are doing by 30% and underestimates their food intake by 30%. You have to be diligent about looking at all the calories you take in through food and drink and how sedentary you are apart from your workout. Ellipticals, treadmills and other exercise equipment often have monitors that estimate how many calories you are burning. Those monitors can be close, but can vary significantly from person to person. I recommend using the calorie displays on exercise equipment as a means of motivation, but not as a guideline to how much extra you can eat. Heart rate monitors are going to be your most accurate count of how many calories you are actually burning. Heart rate monitors let you track and monitor what heart rate range you are exercising in and whether or not it is the appropriate range for you. For more information on heart rate monitors, I would recommend you check out the reviews on Consumer Reports. Physical activity is the best thing you can do to help with your weight and your overall health. Your exercise regimen should focus on fighting a sedentary environment and getting busy! Time spent on cardio equipment is a great thing, but don’t think it will make up for the rest of your day being sedentary. Try to squeeze as much physical activity into your day as possible. 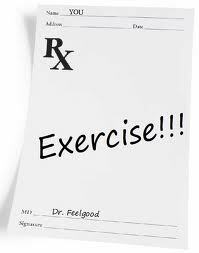 A lot of times I will recommend patients exercise several times throughout their day for shorter periods of time. If they can exercise for 10 minute increments 3-4 times per day, this is just as good, if not better than 30-40 minutes all at once. For most patients I speak with, they find they work harder and get the heart rate more elevated if they are only exercising in 10 minute increments because 10 minutes is not that long. They find when they try to exercise for 30-40 continuous minutes they go at an easier pace in order to pace themselves and thus do not usually get their heart rate as elevated and therefore do not burn as many calories. When looking at a person’s weight loss, we have to investigate more than just calories in vs calories out. Sleep, stress, and other factors can affect weight as well; therefore, it is important to look at one’s total life, not just whether or not someone hits the gym. Weight and obesity are multi-factorial and are really big pieces of the puzzle but not the only pieces that come into play. Whether you hit the gym or get outside and start walking, hiking or riding a bike; the important thing is to get moving. Check out some local fitness centers: Pure Barre in Fort Wright, KY is one of the newest ways to change the shape of your body; Snap Fitness is a fitness center located in Walton, KY; and YMCA of Cincinnati . Next PostNext Having a Hard Time Staying Motivated with Diet and Exercise?